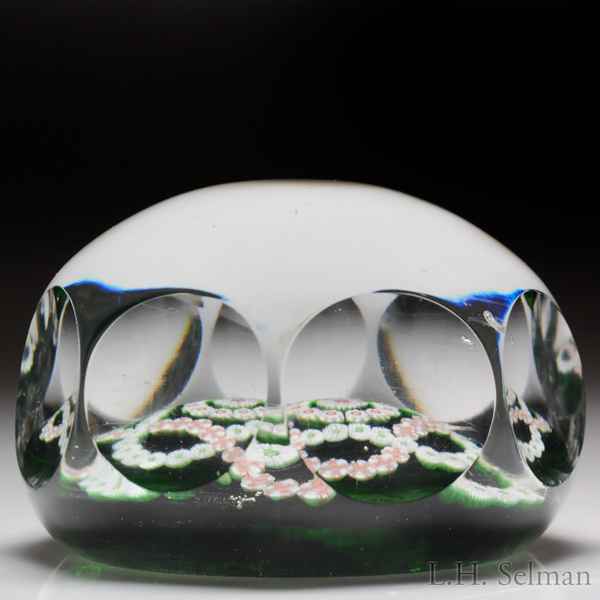 Antique Baccarat entwined double trefoil on translucent green ground faceted paperweight. A red bull's-eye cane ringed by two circles of white star canes forms the center of a design that next moves to a spaced circle of white pastry mold canes. This central motif is framed by two interlacing trefoil garlands, one of complex millefiori made from alternating pink and white star canes and with pink bull's-eye cores, and the other made entirely of white stars, again with pink bull's-eye cores. Translucent green ground. Eight side facets. Small cullet. From the George Kulles collection. Diameter 3".